IDF demolishes home terrorist involved in murder of Rabbi Raziel Shevach. Israeli officer shot by terrorists during demolition. Israeli security forces demolished the home early Tuesday morning of a terrorist who aided and abetted the murder of an Israeli rabbi outside of the town of Havat Gilad in Samaria on January 9th. Ahmed Kunba was charged earlier this month for his role in the terror attack which killed Rabbi Raziel Shevach, a father of six and resident of Havat Gilad. In the attack, Ahmad Nasser Jarar, the leader of the terror cell, shot and killed Shevach near the entrance to Havat Gilad in January. Jarar was later eliminated by IDF forces in February. Kunba aided in the planning and execution of the attack, prosecutors said, and was responsible for a series of previous attacks, including an unsuccessful attempt to infiltrate into the town of Dotan. Early Tuesday morning, Israeli security personnel entered the Palestinian Authority-controlled city of Jenin in northern Samaria as part of an operation to demolish Kunba’s home. 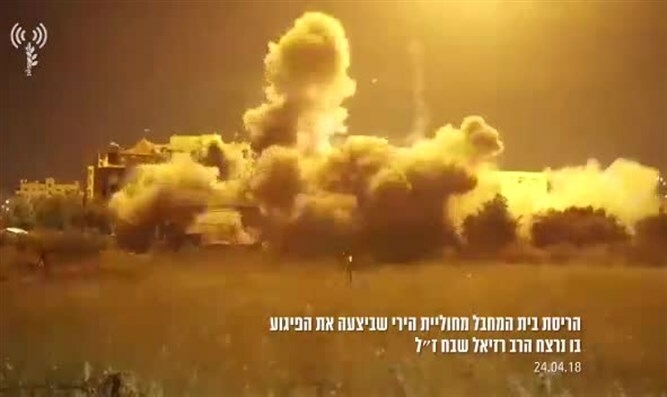 IDF forces secured the entry of a demolition team into Jenin, which planted explosive charges in the building. During the operation in Jenin, rioters attacked Israeli forces, hurling stones at IDF soldiers and Border Police officers. In addition, terrorists opened fire on the Israeli units, wounding one female Border Police officer. An IDF spokesperson said the officer was lightly wounded in the shooting, and was evacuated to a hospital for treatment.